View More In Game & Trail Cameras - Page 3. 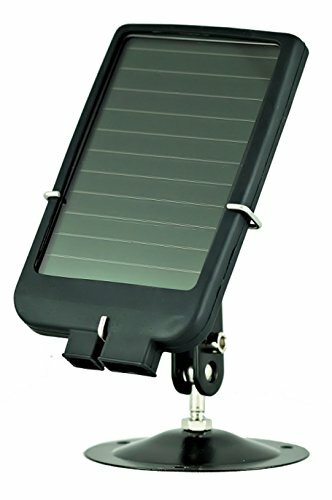 The Ltl Acorn Solar Charger Ltl-SUN series is a charging device designed especially for Ltl Acorn scouting cameras. Ltl-SUN provides a supplemantary power source for the Ltl Acorn scouting cameras, as the solar panel charges the built-in Lithium-Polymer batteries during the day. Under normal usage(when the camera is not used most frequently), Ltl-SUN enables a Ltl Acorn camera to last as long as over a year in the wild. Can be charged through the USB port of a computer or a 5V-output power adapter. Built-in lithium-polymer battery in Ltl-SUN is safe, resilient to extreme temperatures, and its capacity is as large as 2000mAH. Output short circuit protection,(note:a long time of output short-circuit is not recommended, due to the risk of damaging the device). Designed with a sophisticated safeguard circuit: in the case of overload and overdischarge, the power will automatically be cut off, protecting the battery and ensuring is long-term use and reliability. When connected, Ltl Acorn Scouting Cameras will use the solar charger as the priority power source, resorting to camera's own power source only after the power from the solar charger is fully exhausted. Manufacturer: Zhuhai Ltl Acorn Electronics Co.,Ltd. Publisher: Zhuhai Ltl Acorn Electronics Co.,Ltd. Studio: Zhuhai Ltl Acorn Electronics Co.,Ltd. If you have any questions about this product by Ltl Acorn, contact us by completing and submitting the form below. If you are looking for a specif part number, please include it with your message.